Do you want to learn how to start a blog? This post will help you start a blog in under 10 minutes thanks to Bluehost & WordPress. I love blogging. My only regret is that I did not start a blog sooner. I had plenty of ideas but didn’t take action. One of the reasons I didn’t start a blog was fear of failure. But the bigger reason was sheer intimidation. But starting a blog does NOT have to be hard. You don’t have to be a tech guru or web designer to create a quality website. If you feel like you can change people’s lives in any way, I recommend everyone to start a blog. When you start a blog it can be about any topic you’re passionate about. Whether it is helping others with personal finances, fitness, lifestyle, dating, or goal-setting there is more than likely an audience. Blogging is very inexpensive and a great way to share your views with the rest of the world. The worst case scenario you get bored and realize it’s not for you. The best case scenario is that it becomes a passion, provides secondary income, or becomes a full-time career. Blogging is what changed my life and allowed me to make thousands of dollars each month. In 2017 I left my boring corporate 9-5 to run my blog full-time and focus on helping as many people as possible! 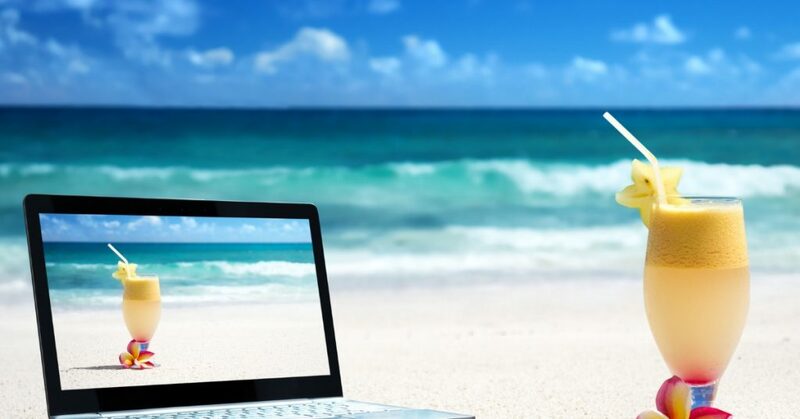 Yes, the laptop lifestyle is possible. It’s amazing to get to do what you love each day. The best part is that you can start a money-making blog very cheap! What do you constantly find yourself talking about to other people? In my case, it was always talking about personal finances and money. A few drinks at happy hour had me asking people about Roth IRA’s and how early they wanted to retire. Everyone is passionate about one or two topics, find one that fits your personality and think you could write about for years. What comes easy to you and not others you know? College failed us. I graduated with a 3.5GPA and felt like I knew nothing still once I entered the real world. I felt like I had no idea what to do with my money once I entered the real world. To learn more I read books, blogs, listened to podcasts until I was confident in my financial plan. Eventually, it just became easy for me to understand and talk finances with other people. I felt blogging would be the best way to share my knowledge instead of entering the finance industry. What are you passionate about or have experience with? Everyone has a ton of skills. When you start a blog it is about finding skills that you feel you could talk about with as much passion now as you would in five years. Will this be fun to write about in 5 years? The LAST thing you want when you start a blog is for it to feel like work. You should use your blog to channel your thoughts and share with the world. Not get home from work dreading it, that is what normal 9-5 is for. Make sure this is a fun activity first. The more you enjoy it the more likely you will be to stick with it and not give up when it is time-consuming. 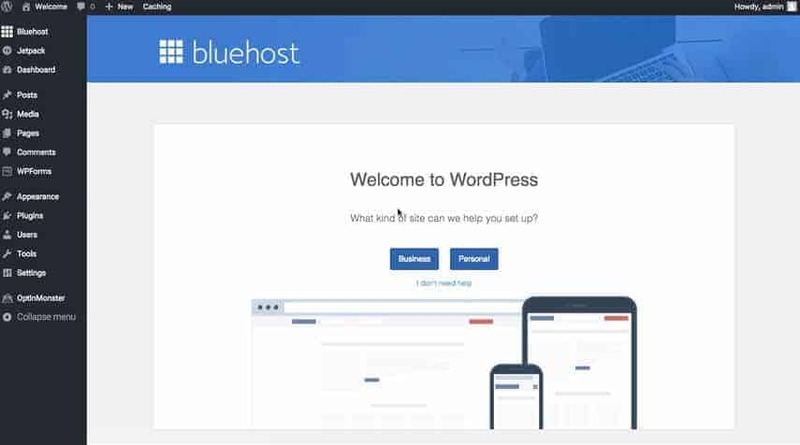 If you’re looking to start a WordPress blog for cheap get started with Bluehost. Bluehost is a great web host and I personally have had a great experience with them. 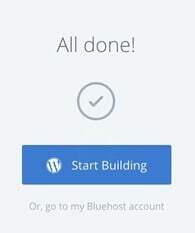 Bluehost is easy to use! Yes, ANYONE can create a WordPress blog easily with my tutorial below. They make it super easy to create a WordPress blog. Bluehost web hosting offers great phone and chat technical support. Bluehost offers a guarantee in case you determine that blogging is not for you for 30 days. 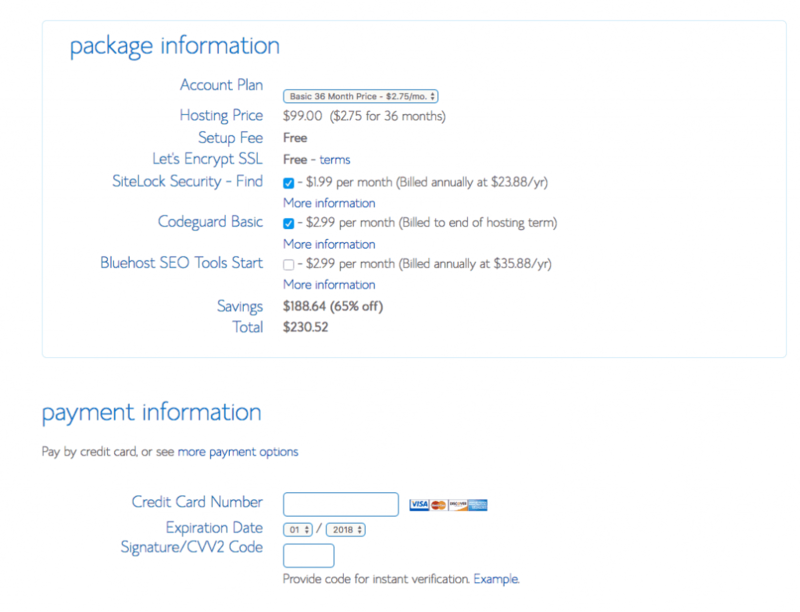 If you sign up for Bluehost, but you are confused for any reason you can get a refund. You will appear much more professional to readers, companies, and so on if you are self-hosted on Bluehost than being on a free blogging platform. Plus, I think search engines tend to rank these higher in results as well (just an educated guess). You will be self-hosted. If and when you want to monetize your blog you don’t have to take any other steps as FREE blogging platforms don’t allow you to monetize as you don’t own the domain. To get started, you will need to head on over to Bluehost to do any of this. 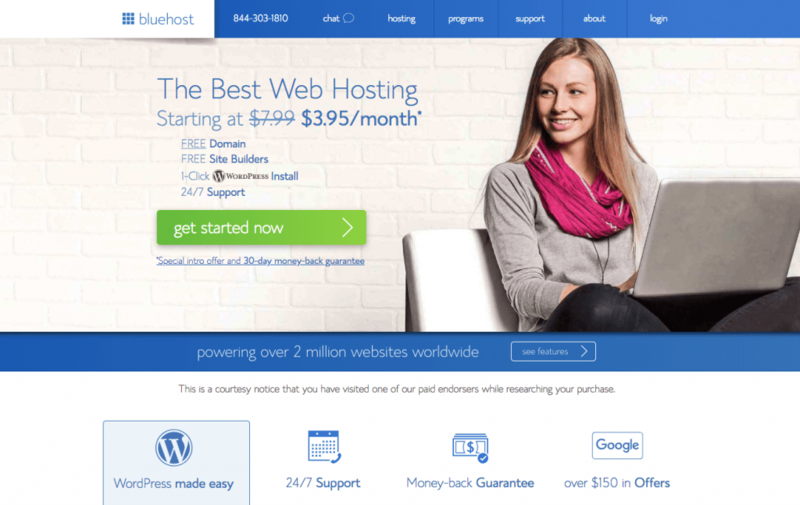 There are many web hosting companies out there, but Bluehost is my favorite web hosting company. It’s no surpsie that some of the top bloggers choose Bluehost for their web hosting needs. If you plan on starting a blog on Bluehost and you are interested in learning how to start a blog on WordPress, continue below. Don’t get intimidated by this process, it’s not as bad as you might think…even if you aren’t tech savvy. Plus, Bluehost has great customer service that you can live chat with or call if you have any questions. Follow this 5-Step tutorial to start your blog. The first thing you will need to do when starting a WordPress blog on Bluehost is to choose a domain name for your blog or website. For example, I used to have supermillennial.com but migrated to this domain after changing the theme of my blog. My biggest recommendation is to choose a broad domain as things can change in the future. It was a lot of work when I switched and wouldn’t recommend it unless you have too! For example, don’t choose www.creditcardrewards.com as it’s a very niche domain that restricts you writing much outside credit card rewards. The decision be tough and I would give some serious thought to this but don’t spend so much time that you never get started. Don’t overcomplicate it! Make it easy to spell. Shorter is better! Avoid numbers as people might confused if it is spelt with the number or word. You can get your domain name directly through Bluehost and it’s FREE with a hosting plan. I recommend doing it this way because you don’t have to sign up with another service like GoDaddy. This will keep it as simple as possible for your blog setup! If you do this, you can get a FREE domain for the first year as long as you buy 12 months of Bluehost web hosting. This makes it well worth it to sign up for at least 12 months of hosting as you will be saving a good amount of money this way. You also get a much cheaper monthly price when you buy at least 12 months of hosting.The 24 month (two year) deal is great but the best value would be purchasing a 36 month plan, as your monthly rate is much lower over the long run. If you have a domain name already and want to transfer to Bluehost check out this link to get started. To get started go to Bluehost.com and follow the steps below. Start by clicking the green “GET STARTED” button. Here is a Youtube video that will also help give you a step by step tutorial to start your blog. Next, choose which pricing plan works best for your budget. There isn’t much difference in my opinion and think you are fine choosing the basic plan. 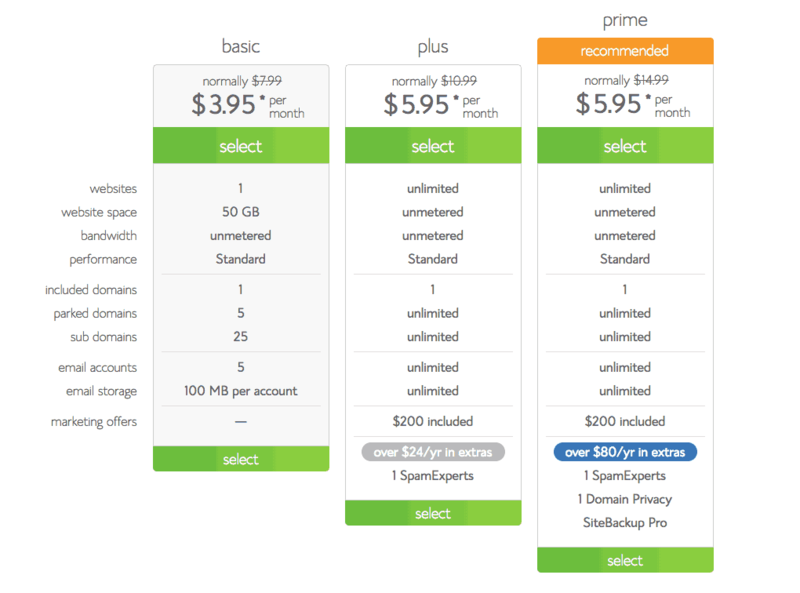 Just a quick note all of these prices are based on the 3 year (36 month) hosting plan. The prices are higher if you choose the 12 or 24 month option. I recommend taking the lowest plan as you can cancel risk-free for the first 30 days with Bluehost. Full refund — no questions asked! Plus, signing a longer contract and spending a few more bucks will hold you more accountable. Plus it will lock in your price for the next 3 years! Once you’ve selected what plan you will find this screen to enter your new domain or the right side if you already have a domain name. Make sure your domain is available by entering it on the left and hitting “next.” If your domain is taken already Bluehost will ask you to create a new domain name. Next, choose your package information. Below is the pricing ($2.75/month for a 36 month contract.) Uncheck the sitelock security and codeguard basic as they aren’t necessary and will save you quite a bit of money. Finally, just add your payment information and you will be all set. Once you hit submit you will be asked for more upgrades, just said no thanks and keep going. Once completed you will be asked to choose a password. Click “Create Password” button and create a secure password for your site. One of the best things about starting a blog is that you can get started instantly! Click the blue login button on the “Congratulations” screen to get started with WordPress. Once you log in Bluehost will give you the option to use a free theme to get started. You can get started with their free theme for now but I will provide recommendations for low cost paid themes. Choose the “Start Building” button to get started with WordPress. You should see this screen of FREE themes. Select one you like and know that you can always change in the future. Once you select your free theme you will be directed to the WordPress dashboard. This will be your new home for your website and where you will make any updates! Choose “I don’t need help” so you can get started and create the blog or website that you want. It’s at this point that I recommend you stay patient as it can take a little time to get used to WordPress or any new platform. Don’t let frustration or doubt keep you down. Remember that blogging can help you share your passions and help you create an epic life on your terms. Don’t worry, everything will work out with patience and consistency. At this point you can continue to use a free theme or opt for a paid theme. I highly recommend going with a paid theme as you get so much value from it and it’s not much money. 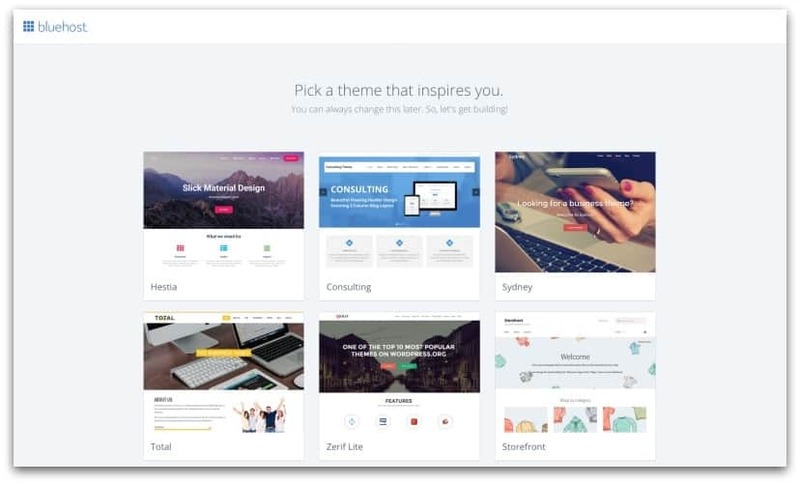 Free themes can look generic, outdated, and not very functional for your readers. Ensure your posts are long enough, usually 500 or more words. I’ve found that 1,000 to 1,500 words posts are better for readers and Google but start where you can. In the future you can always combine posts, add to existing posts or delete posts if they don’t reflect your best work. The general rule is to post new content one or two times a week. I post on Monday and Thursday’s. By posting on the same days you will establish credibility and consistently with your audience. If you post more than two times it might be overkill and hard to keep up with. But posting less could lead to people forgetting about your website. If someone comments or emails on your blog directly respond promptly. Make sure your readers know that you are involved with your blog and care about their feedback. Utilize Facebook, Twitter, Pinterest, and Instagram to share your content. Social media will be one of the main traffic sources as you build up your audience in the beginning. There are tons of free plugins to add social media buttons to your blog but I highly recommend spending the small fee to get Social Warfare Pro plugin. It’s only $29/year and lets you customize buttons, sharing scores, and other features for a professional look. Write for other blogs to expand your audience and increase your relevancy online. Feel free to contact me if you think our audiences would mutually benefit from a guest post. Make your site looks professional and SEO friendly. The easiest way to do this is using Yoast SEO plugin. This plugin will help you tweak any posts to ensure they are readable by search engines (i.e. Google) and drive additional traffic. This includes all permalinks to external sites, headlines, all photos, and other resources. I recommend using this Neil Patel post for a crash course in learning about SEO. Include a search bar, category tags, contact page, about, & disclaimer page if needed. Good luck to everyone on creating their first blog! Making Sense of Affiliate Marketing Course is the best resource to learn how to make money from your blog or website. The creator, Michelle Schroder, has grown her blog to tremendous traffic and income levels. In 2017 she earned well over $1,000,000 and over $200,000 in February 2018. Plus a bonus Facebook group, strategies to grow your blog, and tons more. Enroll in Making Sense of Affiliate Marketing Course today. Pinterest Avalanche is an amazing course to help you massively grow your Pinterest traffic. The creators, Alex & Lauren, earned $818,000 in 2017 from their two blogs. The best part is that they show you how to grow your traffic regardless of blog niche. Learn more about Pinterest Avalanche to start growing your blog traffic today with Pinterest! For other options be sure to check out there other four courses to grow, monetize, and scale your blog here.